It will be a critical flight for SpaceX and NASA. In a matter of weeks, SpaceX will be launching a brand new Crew Dragon spacecraft capsule to the International Space Station — an unmanned test of a spacecraft intended to ferry human crews to orbit. The launch of the crewed Dragon capsule has been a long time coming, despite strong support from NASA. Prior launch dates have come and gone, and this week is no exception: NASA originally planned on Jan. 17 for launch, but thanks to a partial government shutdown that might not happen after all, Ars Technica reported. Despite the circumstances, SpaceX has gone full steam ahead with getting its crewed Dragon spacecraft off the launchpad. Musk tweeted that the private space company was “about a month away” from launch on Friday. If the launch succeeds, commercial human spaceflight is about to become a lot cheaper. And it will be far easier to pilot, too. The Crew Dragon is equipped with state-of-the-art hardware and software that makes navigating the capsule far easier than the complex maneuvers required to steer a Soyuz spacecraft — a remnant of early spaceflight dating back to the 1960s. 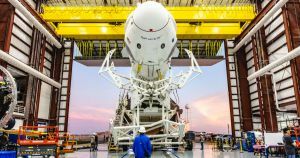 SpaceX has a lot of hurdles to overcome in the upcoming months, and it will likely take a number of test flights until SpaceX is confident enough to allow humans to ride the Dragon. But if SpaceX does succeed — and so far, history seems to be on the company’s side — outer space could seem a lot closer in the near future.